In the growing market of smart lighting, an expandable yet affordable smart lighting solution has been difficult to find. Until now. 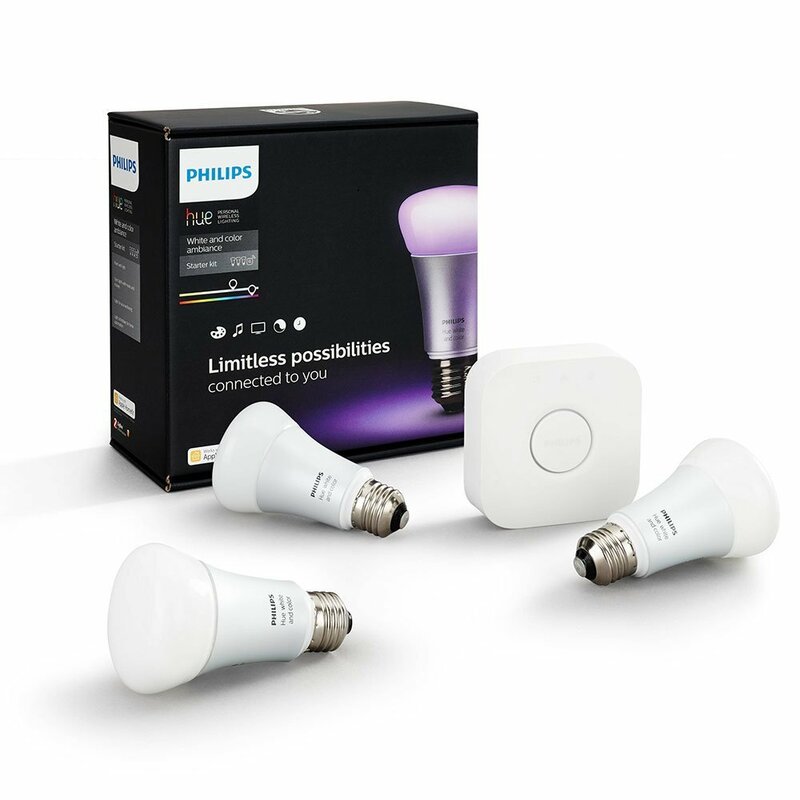 Philips Hue White and Color Ambiance Starter Kit is a perfect match to fulfill the demand of a bulb that changes colors at a comparably low price. The starter kit includes 3 color LED light bulbs and a 2nd generation bridge that wirelessly connects up to 50 lights. The bridge supports many platforms like Amazon’s Alexa, Google Home, Apple’s HomeKit, IFTTT and more. 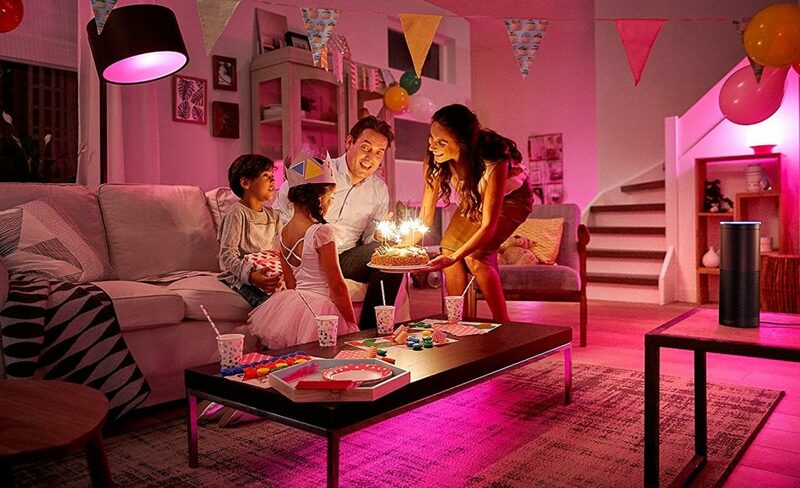 Philips Hue Color Ambience LED bulbs provide color options like: warm, candle like tones and cool, bluish-white daylight tones in the spectrum of white-light and full range of colors in the RGB spectrum. Priced around $170, it is really affordable and strikes a good balance between cost and features. The new bulbs when compared to their old bulbs, still look the same. The White light spectrum is also available in the old bulbs. But if you are looking for a dimmable, smart bulb that can change colors, then the new bulbs are what you need. The new exciting addition is the app for Philips Hue which available for Android and iOS. It allows for a variety of lighting scene presets for your bulbs like the “Relax” and “Concentrate” which are for the white-spectrum. Other stunning presets include “Arctic Aurora”, “Savanna Sunset” and more. There are many other features which are only available if you have the Apple’s HomeKit. For instance, it lets you group your bulbs by room and allows Siri to control the bulbs. It has got a new UI which make it a better looking app and adds some degree of automation for things like turning off the lights when you leave home or have the lights slowly turn on at sunset. I have mine set to dim to 10 percent brightness when I tell Siri, “Hey Siri, it’s movie time”! Location tracking let’s the app know when you’re home and if configured, Hue will turn on the lights just as you arrive home. While broad compatibility of Philips Hue with many hubs and controllers already makes it a compelling pick, the options for expansion are plentiful too. The bridge allows for adding a total of 50 lights, switches and accessories. You can pick from the Hue Go, the Lightstrip Plus, the Tap switch, the dimmer switch and many more to add to your Hue ecosystem. Installation is a breeze. Power the light sources by screwing the bulbs in to your existing light fittings and turn on the wall switches. Plug in the bridge. Download the Philips Hue app and connect to your bridge. That’s it! You’re ready to control your Hue lights and create custom scenes with colors and brightness to your liking.